Students will enjoy hours of quality time outside with this playground set from Kidstuff Playsystems. With tons of events on multiple levels, up to 50 children can enjoy climbing, sliding and discovering new challenges at the same time. Exciting slides, the popular track ride, a Lilypad Walk, turning wheels and a variety of climbers help develop motor skills and problem solving and let kids get active so they can return to class refreshed and ready to learn. 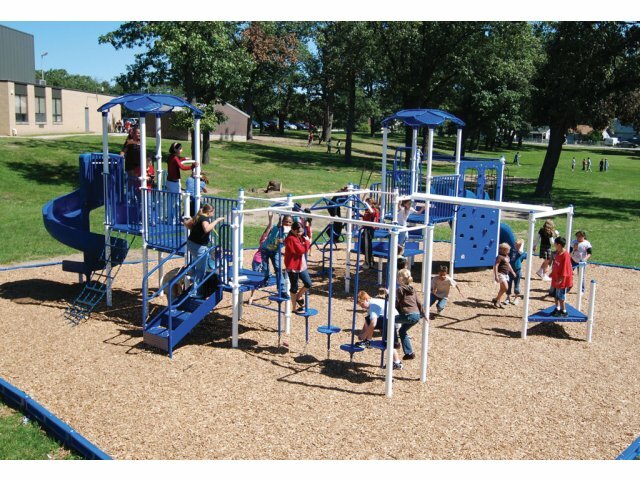 This safe, durable playground set will serve your school, house of worship or community center for many years to come. 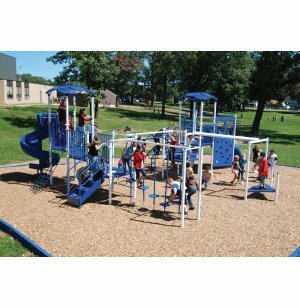 Heavy-duty punched-steel platforms, stainless-steel hardware and steel posts provide sturdy support to children at play. An ADA transfer module ensures that all children can get maximum enjoyment from this enticing playground equipment. Unlimited Fun: Features 11 elevated play events and 1 ground-level event including 2 huge slides, popular track ride, Lilypad Walk, double climbing wall, challenging turning wheels and much more. Shady Play: Two covered platforms feature gable roofs so children can stay cool in the hot sun. Tough Platform: The hex deck is made of fully-welded, heavy-duty punched steel. ADA Accessible: An ADA transfer module ensures that all children can get in on the fun. Super Strong: Tested at over 8,000 pounds.